The other night, I attended a wonderful fundraising event for the Red Cross effort towards victims of Typhoon Haiyan (donate here) which featured a delicious meal of Filipino Home-Cooking, On the menu were Lumpia, the Filipino take on fried rolls, Tocino, sweet-and-sour Filipino-style bacon, Pork Adobo (cooked with vinegar), Chicken Adobo (cooked with coconut milk), pancit (noodles with shrimp and ground pork) and for dessert, Kutsinta, a brown rice cake best eaten with grated coconut. Also for sale was a terrific retro Filipino cookbook, ‘Philippine Cooking’, by Herminia Robles Cariño, or Hermie. Hermie’s daughter Marites told me that her mom self-published this book in the eighties. 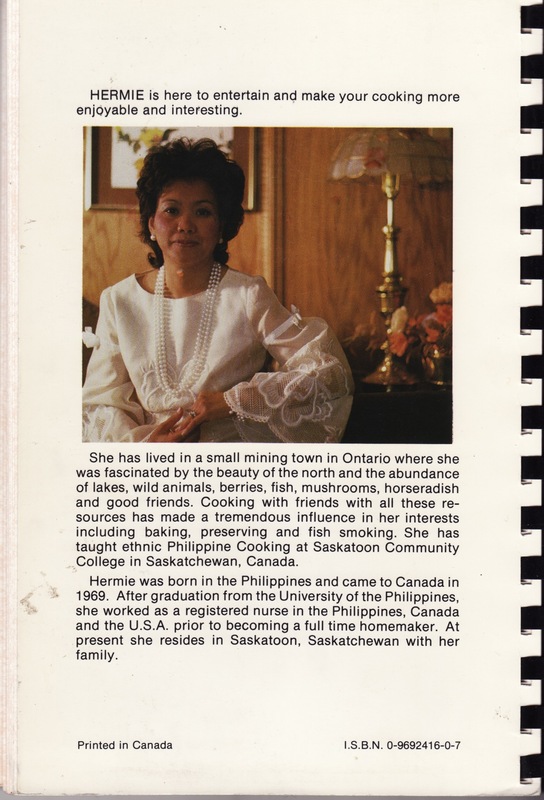 Her dad took all the photos, her kids did the typing and printing, and the book was distributed around Saskatoon where Hermie also taught Philippine cooking at the community college. Click on the photo to read a short biography of Hermie. 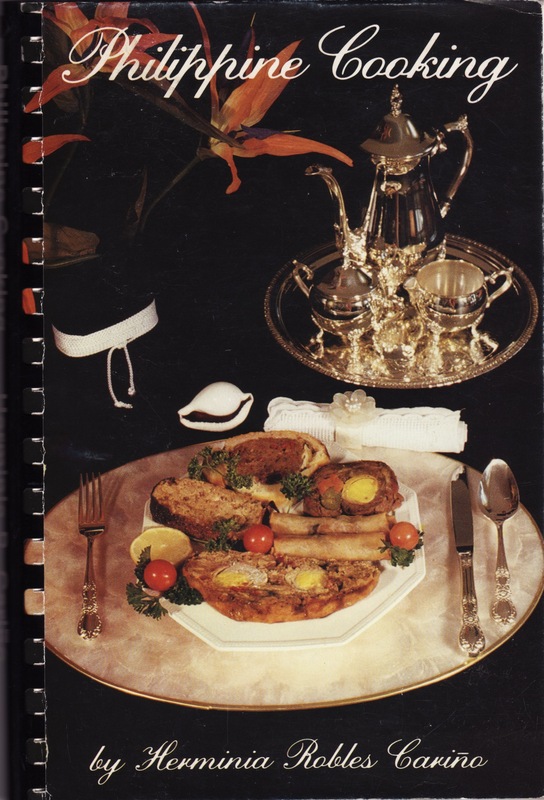 the cover of ‘Philippine Cooking’, first published in 1986. Philippine Cooking” came about in order to quench my thirst of writing a cookbook that contributes to widening your knowledge of the Philippines and its cuisine…These recipes have been adapted to today’s lifestyle and have been tried in my family’s kitchen over the years…I hope this simple cookbook will add to a better understanding of the Filipino people and our culture. Hermie also includes a brief introduction to the Philippines, their food and culture, and ends the book with some Tagalog phrases and words, and a glossary of cooking terms and ingredients. Here are her recipes for the traditional Sinigang, or sour soup, (with Shrimp), Pork Adobo, and Atsarang (Pickled) Papaya. Want to learn more about Filipino cooking? Marvin Gapultos of the LA food truck The Manila Machine, the Burnt Lumpia blog, and The Adobo Road Cookbook discusses Adobo in this podcast excerpt. Donate to the Red Cross Typhoon Haiyan Fund.